Chelsea: Has Jose Mourinho blown the title already? The sound of Jose Mourinho insisting he is the best man to lead Chelsea just four months after taking them to the Premier League title is a measure of the scale of their decline this season. Chelsea's 3-1 defeat at Everton on Saturday was their third in five league games - adding up to the club's worst start in 29 years as they lie in the uncharted territory, for Mourinho at least, of 16th place in the table. Is Chelsea's title defence over already? It takes a brave man to write off Mourinho and Chelsea after only five games of the new season - but even "The Special One" himself was reduced to offering assurances they would not be relegated after being bundled out of the way by Everton. Study the evidence and, premature as it may seem, it looks like Chelsea's closest rivals Manchester City are already over the hills and far away, with five wins from five and 11 points ahead of the faltering champions. Chelsea have lost four of their last seven Premier League games - they had lost only four of their previous 44 before this run. Of course Chelsea will improve. Mourinho is too good a manager, there is too much quality locked in his squad for this poor sequence to continue and his talk of avoiding relegation sounding like a sideways swipe at those revelling in his struggles. 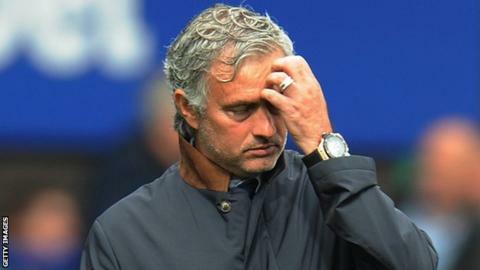 This is the first time that Jose Mourinho has lost two successive Premier League games since May 2006. In their last seven Premier League games, Chelsea have conceded 16 goals - one more than they conceded in the whole of Mourinho's first season in charge in 2004-05 (15). The last time that Chelsea had a worse start to a top-flight season was in 1986-87 (three points - P5 W0 D3 L2). They finished that season in 14th position. Chelsea have already equalled their tally of defeats from the whole of 2014-15 (3) after five games of 2015-16. Chelsea have lost four of their last seven Premier League games - they had only lost four of their previous 44 PL games before this run. Chelsea's position of 16th after five games is the worst start by a defending champion since Blackburn in 1996. Rovers too were in 16th place after five games, but they were only eight points behind leaders Newcastle. The bottom line is, however, that City are currently head and shoulders above the rest of the Premier League, showing a capacity to dig out wins at Crystal Palace - with a late goal from Nigerian teenager Kelechi Iheanacho - as well as outclassing Chelsea themselves. Chelsea are already looking for City to lose four games while they start winning theirs - and the opposite looks more likely at the moment. The crown may have already been taken off their heads. BBC Sport pundit Robbie Savage told Radio 5 Live: "Chelsea had no idea. I was looking at Jose in his press conference before the game and he didn't look quite right. "I think the league is over for them, I really do. I can't see them clawing back 11 points on City." He said after the loss at Goodison Park: "The moment is so negative that everything goes against us. At the tactical meeting we had this morning even the computer broke." The more serious fractures are to be found at sources that have previously been the foundations of reliability for Chelsea and Mourinho. Chelsea's successes, and indeed Mourinho's success at Porto, Inter Milan and Real Madrid, have always been built around solid, reliable defence. Steven Naismith's hat-trick for Everton means Chelsea have now conceded 12 league goals this season, with Mourinho's trusted defensive personnel suddenly vulnerable. John Terry played at Everton but was substituted in defeat at Manchester City and sent off at West Bromwich Albion. Gary Cahill was only a substitute at Goodison Park while Branislav Ivanovic, so reliable for so long, has seen his form collapse. It is the first time Mourinho has lost two successive Premier League games since May 2006 and in their last seven Premier League games Chelsea have conceded 16 goals, one more than they conceded in the whole of his first season in England, when they let in 15 as they won the title. Further forward Cesc Fabregas looks a shadow of the figure of such influence last season while striker Diego Costa, the merchant of menace who provided physical presence as well as goals last season, is waging his usual wars on opponents but not much else. Costa announced his arrival in the Premier League from Atletico Madrid with seven goals in his first five league games last season - a year on he has only one and looks nothing like the threat. Mourinho has also had to cope with the loss of first-choice keeper Thibaut Courtois for three months after knee surgery while the fall-out from his decision to demote team doctors Eva Carneiro and Jon Fearn after they angered him by coming on to treat Eden Hazard against Swansea City on the opening day rumbles on. So yes, plenty has gone wrong - now it is up to Mourinho to put it right as he finds himself in an unfamiliar state of struggle. Mourinho set his sights on bringing Everton's elegant 21-year-old England defender to Chelsea as his marquee summer signing but ran into a club, and manager in Roberto Martinez, that simply refused to budge. Everton were unhappy at what they saw as Mourinho and Chelsea's public pursuit of Stones, who had a transfer request rejected after a third bid of £30m was turned down. Outstanding against Chelsea on Saturday, how Jose Mourinho would have liked to partner John Stones with John Terry. Mourinho was, in the end, reduced to doing a £3m deal with Nantes for Senegalese international Papy Djilobodji, admitting: "It was not my choice. It was the choice of someone I trust completely, which is the same." The failure to land Stones was put into even sharper relief by the youngster's superb performance in front of Mourinho at Goodison Park. Mature and level-headed enough to put the speculation behind him, Stones delivered the sort of Rolls Royce display that made Chelsea so keen to secure him. Stones showed the sort of assurance, class, pace and reliability that is just what Chelsea's rocking rearguard needs right now. Mourinho's trademark is bristling defiance in these rare times of struggle - but there have been traces of delusion in his demeanour this season. He has been prickly on many occasions already, fostering a siege mentality, but was actually quite calm in defeat at Everton although he said: "I know that lots of people are happy finally to find me in a situation like this after so many years. Fair play, enjoy. I will enjoy my day on Sunday." Where Mourinho veered off track was to suggest the game at Everton was "completely under control" adding "in every game they (Chelsea) deserve better results." This is palpably not the case, with Mourinho's claim that the 3-0 loss at City was a "fake" result a ludicrous assertion - unless he felt City should have won by more. Former Chelsea striker Chris Sutton told BBC Sport - after hearing Mourinho's comments - "Jose Mourinho is talking rubbish, saying his team did not get what they deserved. "Everton were much the better side. It's all very well Jose coming out and giving an interview to the media smiling away - he's culpable. "That result was very unlike Chelsea. Jose won't be going anywhere, but you cannot afford to start the Premier League sluggishly and they have done. They are treading water, or really going backwards. "This is the first time in his Chelsea career that he has been under real, real pressure." Will Jose Mourinho last the season? Mourinho will feel the pressure of results - born winners always do - but it is stretching the point to suggest there are questions over his job or his future. When Mourinho left Chelsea in September 2007, his relationship with owner Roman Abramovich had broken down and the tensions made his departure inevitable. Mourinho has never stayed at any club longer than three years but he signed a new four-year deal in early August and has stated his intention to build a long-term dynasty at Stamford Bridge. Predicting any moves from Mourinho is a hazardous occupation and he is not used to this territory. At Goodison Park he spoke like a man preparing for a battle - not with his owner but to fight his way out of a dreadful start to this season.